Although it looks like rock, coral is actually alive. (Image: Henry Burrows). Coral is made of many tiny organisms called polyps. These soft-bodied animals are related to jellyfish and sea anemones and have existed for tens of millions of years. At the base of a coral polyp is a hard limestone skeleton called a calicle (pronounced CAL-ih-cull), which attaches to a rock on the sea floor. This is the very beginning of what will eventually become a coral reef. The original polyp divides itself into thousands of clones which spread out along the rock. 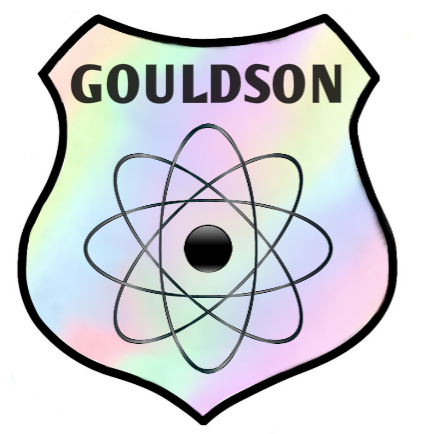 These calicles remain connected so that the colony acts as a single organism. Other kinds of coral polyp will do the same, until the whole area is covered – this is what we call a reef. 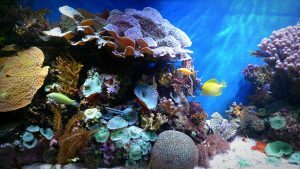 Coral reefs are usually found in shallow, tropical waters where the sun’s rays can reach and warm the algae they co-exist with. Corals have a symbiotic relationship with a particular type of algae called zooxanthellae (pronounced ZOH-oh-ZAN-thell-ee). This means that they work together and neither organism can exist separate from the other. 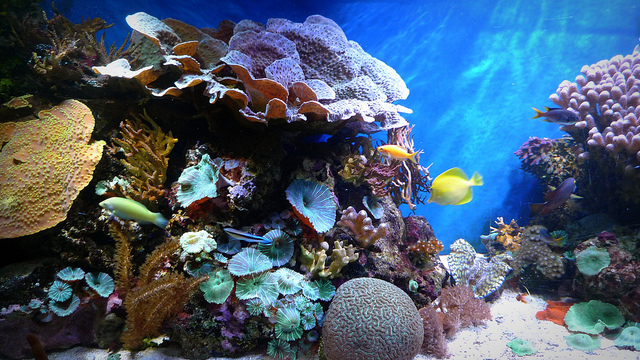 In this case the coral gives the zooxanthellae shelter and carbon dioxide, while the algae uses the carbon dioxide and energy from the sun’s light to create food and oxygen for the coral. This process is called photosynthesis (pronounced foto-SIN-the-sis). The zooxanthellae is also what gives coral its vibrant colours. Although coral has venomous tentacles that can grab tiny creatures, most of its food comes from the algae. 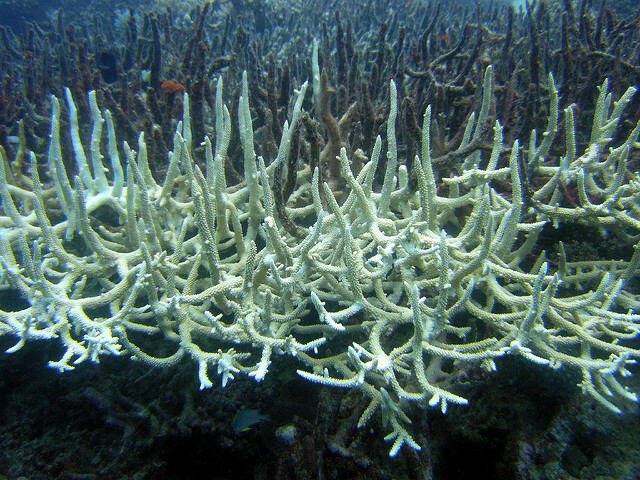 A bleached staghorn coral. (Image: Matt Kieffer). Unfortunately, coral and its algae are among the casualties caused by factors related to climate change. As well as oceans warming to higher temperatures than ever before, coral bleaching can be caused by pollution, over-exposure to sunlight when temperatures are high, and being exposed to the air during abnormally low tides. When one of these events affects a reef the coral becomes stressed and separates from the zooxanthellae. 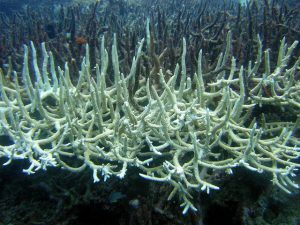 Not only does this mean that the coral has lost its major food source, it also leaves the coral looking white and bleached. This doesn’t mean that it’s dead, but it does mean that it’s very stressed and sick; if the water temperature returns to its normal range quickly then some of the coral may survive. Of course, this doesn’t just affect the coral and the now homeless zooxanthellae. Tiny fish that shelter in a coral reef are no longer camouflaged against the bright background, and are more likely to be eaten by predators. These larger fish are also more visible against the white coral and in turn are eaten themselves. The effect ripples up the food chain until the entire ecosystem is on the verge of collapse. Scientists recently found that 93% of Australia’s Great Barrier Reef, the largest reef system in the world, has been bleached. For an easy-to-understand explanation of climate change and how we can all help fight it, read this article on Jump! magazine.